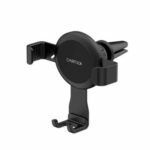 The ring holder and car air vent magnetic mount provides two uses, which allows you to use the combination as a car mount or use the ring holder as stand separately. 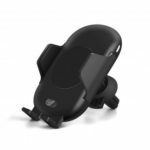 The car mount is 360 degree rotatable, enabling you to adjust it to any desired angle you like. Ring holder comes in a round shape with zinc alloy coating, looks classic and slim in size, capable of keeping your phone steadily placed during driving and ensuring safety. Provides two use. You can use them separately or in combination. Allows one hand operation while driving, enhances safety. 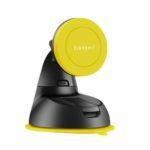 The car mount is 360 degree rotatable, you can adjust it to any desired angle for excellent viewing and driving experience. 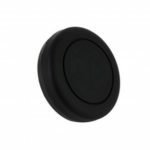 6 powerful permanent neodymium magnets in the head of phone holder ensures your phone stay in place even during an emergency braking event, while not interfere with cell phone signal. 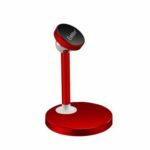 The cell phone ring holder is an efficient way of preventing your phone from slipping off your hands, the ring holder can function as a temporary stand when you place your phone or any other electric equipment on a table or any flat surface. Classic round shape ring with zinc alloy coating to keep the original color and prevent it from fading away. Only 4 mm in thickness, portable and keep your phone steadily placed.